The featured photo has nothing to do with the topic of this week’s post. It shows a red-spotted newt found by Brian Balik and Matt Neff in our trailside swale while previewing the Quarry Gardens site for the Virginia Herpetological Society’s survey on Saturday, June 4. The big news this week is that (hurrah!) we have been confirmed by the IRS as a non-profit, tax-exempt, private eleemosynary organization: The Quarry Gardens Foundation. This means that the URL for our web page will be a dot-org rather than a dot-com (don’t worry, we’ll have automatic forwarding to the new landing page from the current one), and we’ll have to get new business cards and bank accounts and such. But these are minor matters. 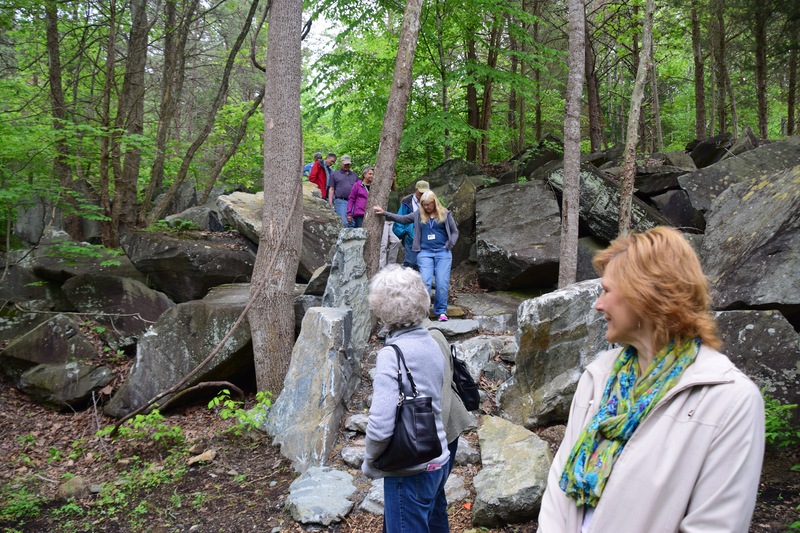 Of significance, it means that we will now be able to solicit tax-exempt memberships and contributions, create partnerships with other non-profits, and seek help from volunteers to pursue our primary and educational purposes of furthering knowledge of native plants of the Atlantic Piedmont and the history of soapstone quarrying in Nelson County. 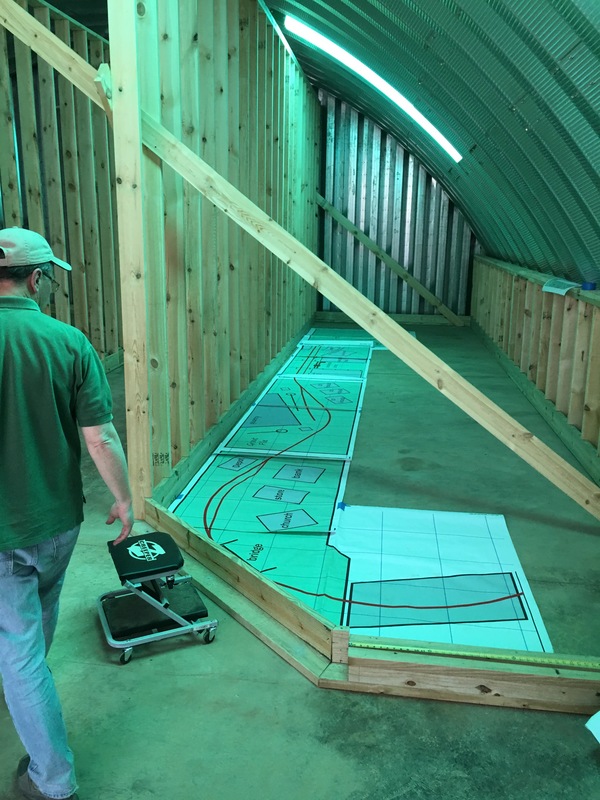 We are also beginning to plan for how we will operate after the opening date (still on schedule!) of April, 2017. We will be open to the public at no charge, but we do need to control access for various reasons, not the least of which is that the site is inherently dangerous and large enough to be confusing to first-time visitors. Thus, we want to ensure that everyone gets at least an introductory explanation by an “official” guide (likely Bernice or Armand). 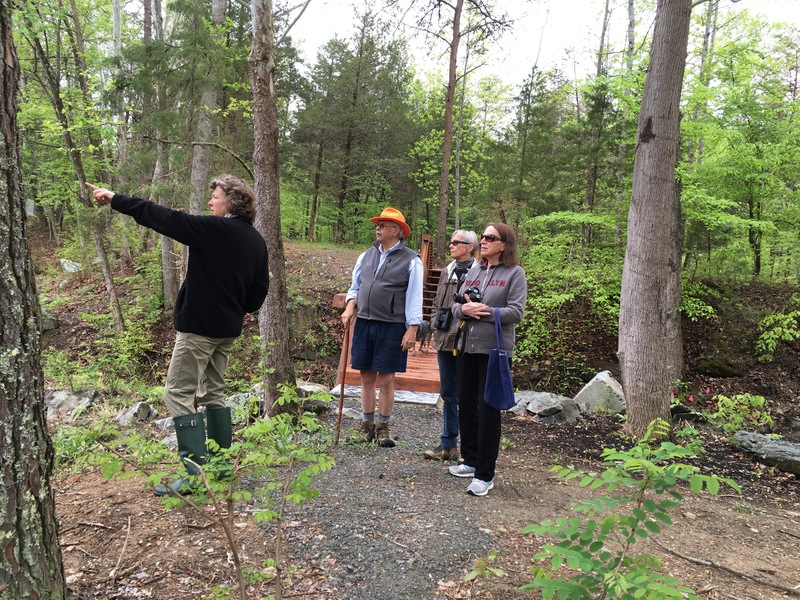 We plan to start by offering free guided tours of the gardens for small groups on Fridays, Saturdays, and Sundays, available spaces and times to be posted on the website and filled first-come-first-served. Special tours by groups and organizations can be booked for other times, if arranged well in advance, as will use of the classroom facilities for meetings or lectures. Those who choose to join the Foundation at various membership levels will be given special access rights. Our visitors from various gardening and other interest groups have given us helpful insight, but we have much more to think about. Thanks for all your support and interest so far. It’s been fun for us, too. Next posts will report how we fare on the PBS Virginia Home Grown TV show May 31 (later tonight), and what we learn at the American Public Gardens Association conference in Miami next week. Stay tuned. Despite the almost continuous rain of the past 20 days (or perhaps even because of it), the plantings set last year have begun to show, like those in the featured picture next to the viewing platform. But please gods, enough is enough. 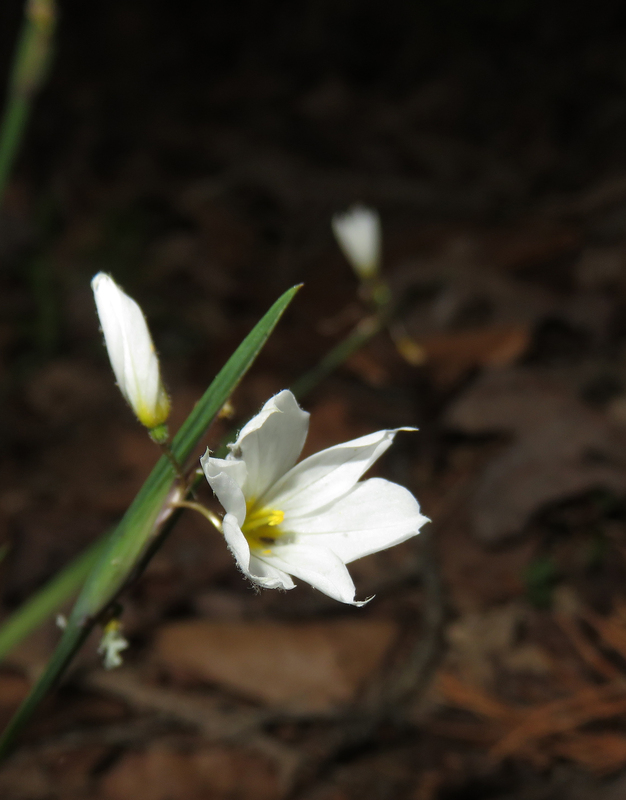 Last Monday, Rachel and her crew installed nearly a thousand more plants—and discovered some interesting natives: A suspected Sisyrinchium Albidum, white blue-eyed grass (never before seen in the Piedmont); Smilax Bona-nox, fringed greenbrier, having mottled leaves with prickers around the margins (a Nelson county first for a plant that is rare in the inner Piedmont); and a growing colony of Mountain Bellwort. On Tuesday morning, pouring rain slowed to a patter just long enough for the crew from PBS station WCVE/WHTJ’s Virginia Home Grown to film host John Thompson interviewing Armand and Bernice at the Quarry Gardens. 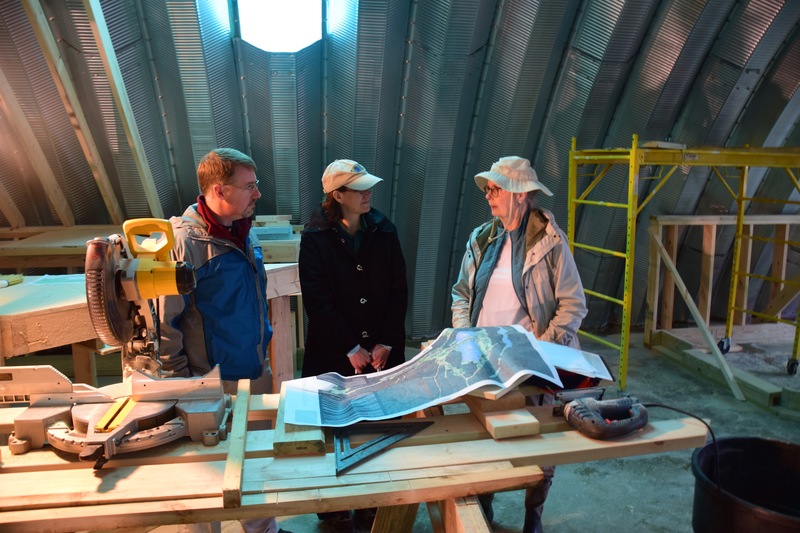 On May 31, we’ll take a few plants and a soapstone sample to the studio in Richmond for demonstration in their Garden Shed. We’ll also answer questions from viewers. The show will be broadcast live that evening at 8 pm. Tune in then—and call in your questions (not too hard, please). 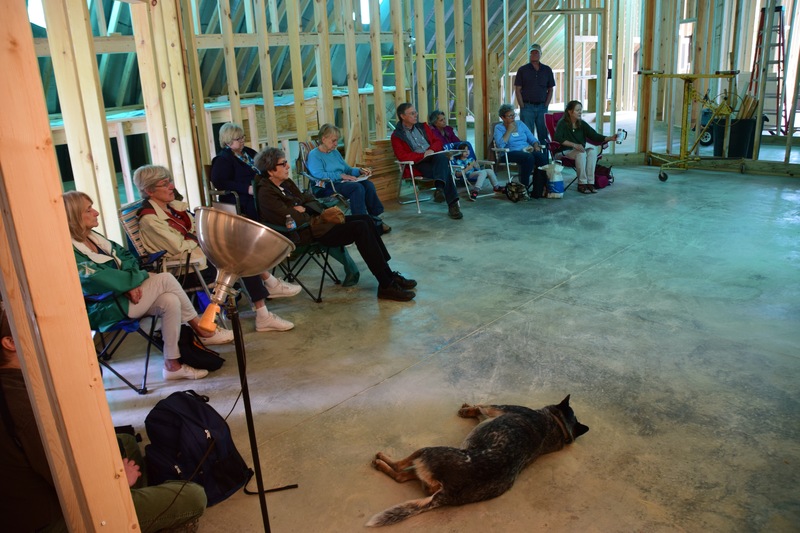 Thursday was much better—cool and overcast—for a preview tour by twenty Fluvanna County Master Gardeners and friends, who held their monthly meeting and ate lunch in the Quonset hut’s unfinished classroom before hitting the trail. Expect news from the herpetological survey and the national meeting of the National Association of Public Gardens next time. The lead picture is of a pretty little pink dogwood that we just noticed at the edge of the Prairie below the viewing platform. But the main topic of this post is about new plants. One of the greatest challenges in starting a garden such as this is acquiring the right plants—especially if the goal is to build plant communities matched to ecosystems where they might naturally occur. As of today, some 9,000 plugs, quarts, gallons, and larger of about 40 species have been installed; 4,000 are on order; and countless others are being sought. Overseeding from last fall will give us further richness—plants that will appear in unpredictable numbers, especially in the Prairie below the viewing platform. The photo of Rachel with flats of newly-arrived plugs to be installed is from April, so these have already gotten into the ground. Plugs planted last fall and just before the April drought have so far shown almost 100% success—why we like ecosystem modeling. Last summer and fall the Center for Urban Habitats team collected seeds here of some of the more elusive and locally adapted species, and grew them into plugs—with added greenhouse space from the Wintergreen Nature Foundation. These are being planted this spring. 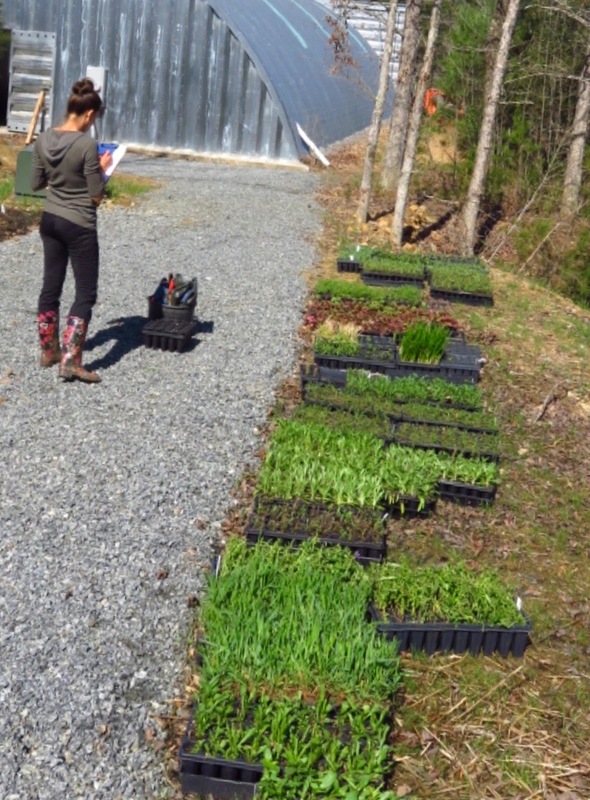 North Creek Nursery, New Moon Nursery, The Natural Garden, Wintergreen Nature Foundation and Monticello’s Center for Historic Plants are supplying plants in wholesale quantities. And the plant sales of Charlottesville Tree Stewards, Piedmont Master Gardeners, and the Jefferson Chapter of the Virginia Native Plant Society have come through with small numbers of harder-to-find species. We hope our demand for local genotypes will help to create markets, and make such plants more available to other gardeners in this area. There seems to be great interest in native plants. 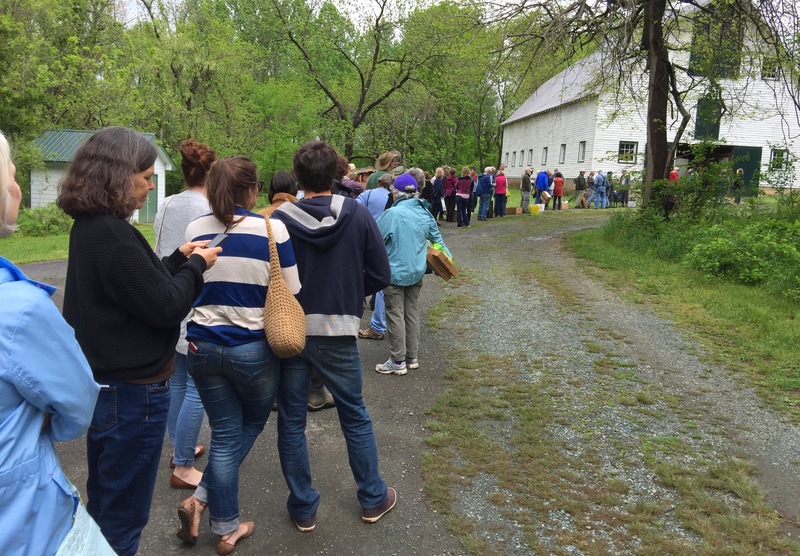 Here’s a photo of the line last weekend at 12:50 for the 1:00 VNPA (Virginia Native Plant Association) at Ivy Creek’s barn. Shopping here is something of a contact sport insight quarters. Our reward was several pots of Spring Beauty we hadn’t found elsewhere. 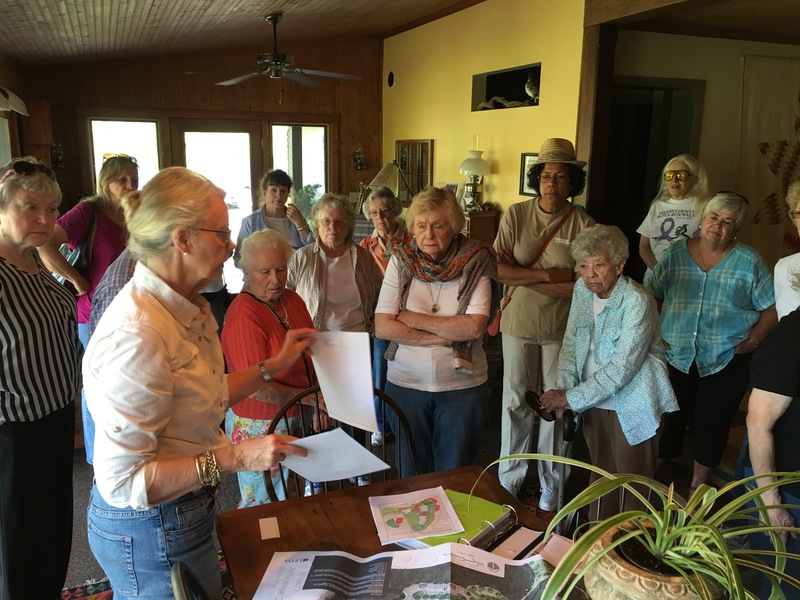 We had visits during the month from the Nelson County Garden Club (on the left) and from the proposed Mcintyre Botanical Garden (on the right)—and are anticipating several others in the next few weeks. Finally, here’s how the layout for the model of the Nelson and Albemarle is progressing.